Last week Carolyn and I had a few days in San Francisco and the wine country, and of course that means we enjoyed some great food and cocktails. Ironically, the wine country is filled with signs promoting cocktails along with wine- and we think this is a great thing. Wine country is also farm country and there are all sorts of tasty fruits and vegetables that can make their way in to cocktail menus- and they are, often with tremendous success. Meanwhile, San Francisco continues to be a hotbed for great food and cocktails. If you like to eat and drink, San Francisco is a very easy place to like. And our inspiration for this week’s drink, the Orchard Moonraker comes from a visit to Bar Agricole, one of the best bars (and restaurants) in San Francisco. Bar Agricole is well-known for its cocktail program and a mix of both classic and creative drinks. The interior is modern and clean, the spirits top quality, the glassware beautiful and the bartenders knowledgeable. Altogether, an excellent place for a cocktail, and a great place to discover new flavors. In this case Bar Agricole featured their take on a classic cocktail, the Moonraker, which comes all the way from the Savoy Cocktail Book of the 1930’s. The original recipe for the Moonraker is equal parts brandy, peach brandy, quinquina (Lillet blanc or Cocchi Americano) and a few dashes of Absinthe. We tried it this way with Armagnac and Rothman and Winter’s Peach liqueur- and it is a good drink. Bar Agricole’s adaptation was brandy, Leopold Brothers Peach Whiskey, Cocchi and a few dashes of Absinthe. This was even better. 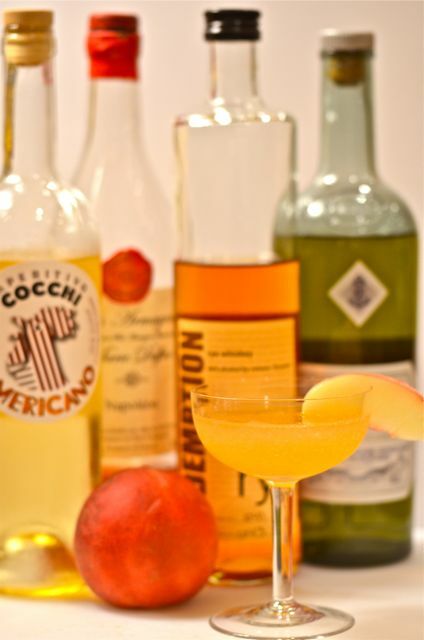 The brandy and peach whiskey feature floral and sweet peach flavors, while the Cocchi adds herbal and bitter notes and the Absinthe cleans the palate. A bit unusual, but a very tasty drink. If you like Manhattans or Sazeracs, you may really enjoy the Moonraker. We certainly liked it. But as we are gardeners, and we have fresh peaches from the farmers market (ours are about a 10 days out- we are very excited), we adapted the Moonraker one more time to include fresh peaches and more common ingredients. 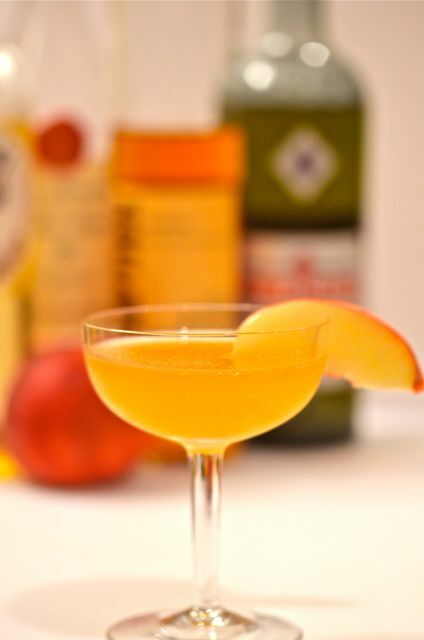 Our version includes brandy, rye (you can use bourbon), muddled peaches, Cocchi and Absinthe. And if your peaches are not particularly sweet, a touch of sugar may help. 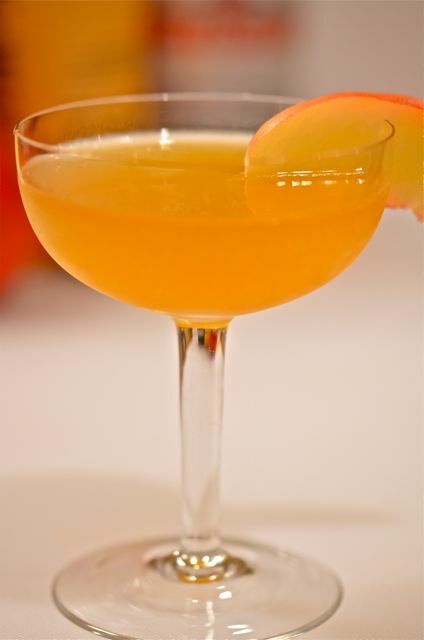 The Orchard Moonraker, features overt floral and peach flavors and is a bit less sweet (peach liqueur is very sweet) with a touch of spice and depth from the rye and brandy. We use a little less Cocchi (you can substitute Lillet). The other notable difference is that the drink is cloudy from the muddled peaches. But overall, a tasty cocktail and fun way to enjoy peaches in season. Orchard Moonraker cocktail and ingredients. As for the name, it has nothing to do with the James Bond movie- the recipe has been around a lot longer. But a bit of internet research doesn’t give much more connection to the cocktail. A Moonraker is the name of a small, uppermost sail on some old ships, but is also a knick-name for some old-time British smugglers. Neither seem to have any real connection to the drink, and if they did it’s lost in time. But “Moonraker” sounds good, and the cocktail tastes good. So we will just have to drink it. A few dashes of simple syrup if the peaches are tart. Add the peach slices to a cocktail shaker and muddle thoroughly. Add the brandy, rye, Cocchi, Absinthe and ice. Shake well to combine. Taste for sweetness and add a bit of simple syrup, if needed. Double strain (the peach pulp can be thick) into a chilled cocktail glass or coupe. Garnish with peach slice and serve. Combine all ingredients in a cocktail glass with ice. Stir until cold and strain into a chilled cocktail glass, flute or coupe. Serve. The addition of fresh peach sounds wonderful! How do you EVER get any work done on the farm? Probably the same way as me– grudgingly! That would be a very accurate description for most work. Thanks, we will have to try it. All the peaches will ripen within a few days of each other and some ill have to be preserved (although we will eat most out of hand). Have you posted a peach / bourbon infusion? I have not posted peach bourbon, but I made last year with 750 ml bourbon, and about 3 peaches, peeled and sliced. Infuse for about 1 month or until you like it. I also like canning sliced peaches in simple syrup with a splash of amaretto. They are awesome on pancakes.